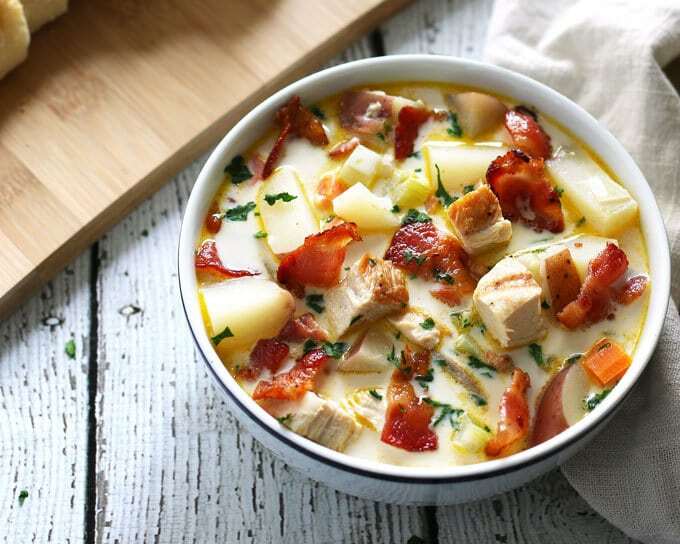 This chicken potato chowder is great for using up leftover grilled chicken breasts. It is easy to make and super tasty thanks to added bacon. I am always looking for ways to use up leftover grilled chicken. We tend to buy the family pack of chicken breasts when they are on sale and then we grill them all at the same time. A little salt, a little pepper, and then meals for days. Chicken sandwiches are one of my go-to’s, as is this grilled chicken and avocado salad. 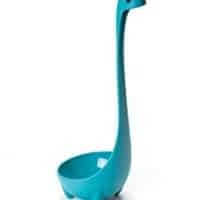 But sometimes, even in the summer, I want soup. When that soup craving hits, I make chowder. 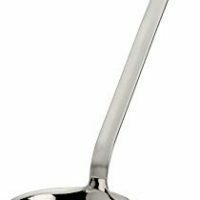 I have had a few people tell me that I’m nuts because I eat soup year-round. I have found, however, that there is a whole gang of summer soup lovers. We really should start a club. 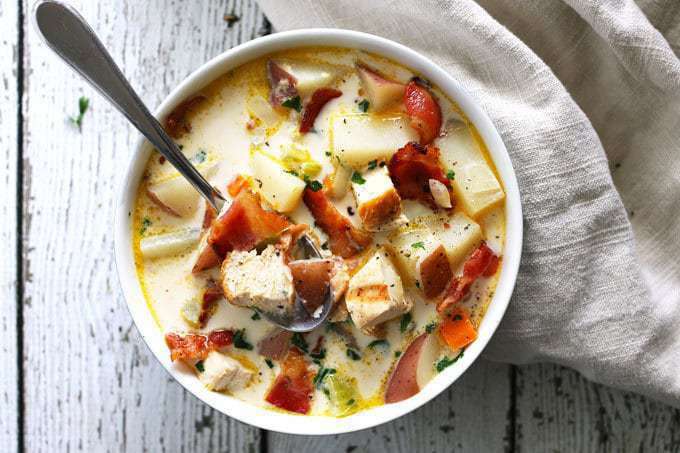 This chicken potato chowder is hearty thanks to large amounts of grilled chicken and potatoes. It’s tasty thanks to some bacon. 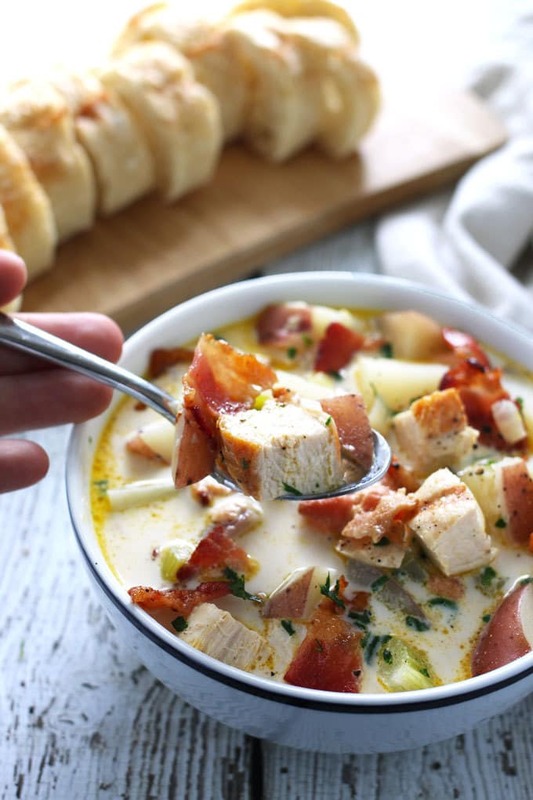 I just couldn’t resist adding bacon to this chowder. I like my chowder to be on the thin side – if you are a fan of thick chowder, you could add a little cornstarch to the liquid to thicken it up. You could also decrease the amount of broth/stock by up to 1 cup. 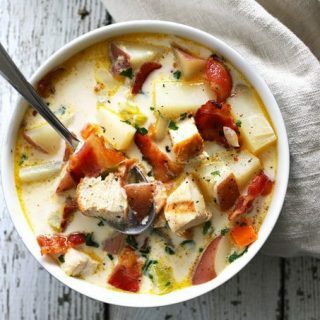 If you don’t have leftover grilled chicken, cook about one and a half pounds of chicken breast to make this chowder recipe. You could also use rotisserie chicken – I bet that would be really tasty! I use red potatoes with the skin on; we scrub them really well with a brush and then chop them up. You could use any potatoes that you like – that is just my favorite kind in chowder. In a large soup pot, heat the olive oil over medium heat. When oil is hot, saute the onions for 5 minutes. Then add the celery and carrots, stirring frequently and sauteing for an additional 5 minutes. Add the chicken broth, chicken and potatoes. 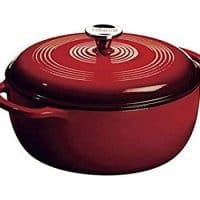 Increase heat to medium high and bring to a boil. Reduce heat and simmer for 10 minutes. After 10 minutes, add the half and half and paprika. Cook for an additional 10 minutes, or until the chowder is back to eating temperature. While the soup is cooking, begin cooking the bacon in a frying pan. Cook all bacon until crispy and then crumble it into large chunks. Season the chowder to taste with salt and pepper. Stir in the cooked bacon just before serving. 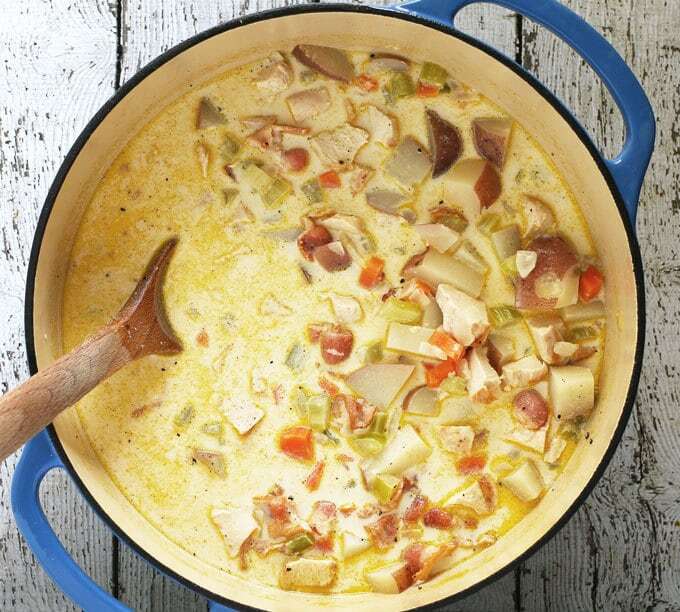 Looking for more chowder recipes? 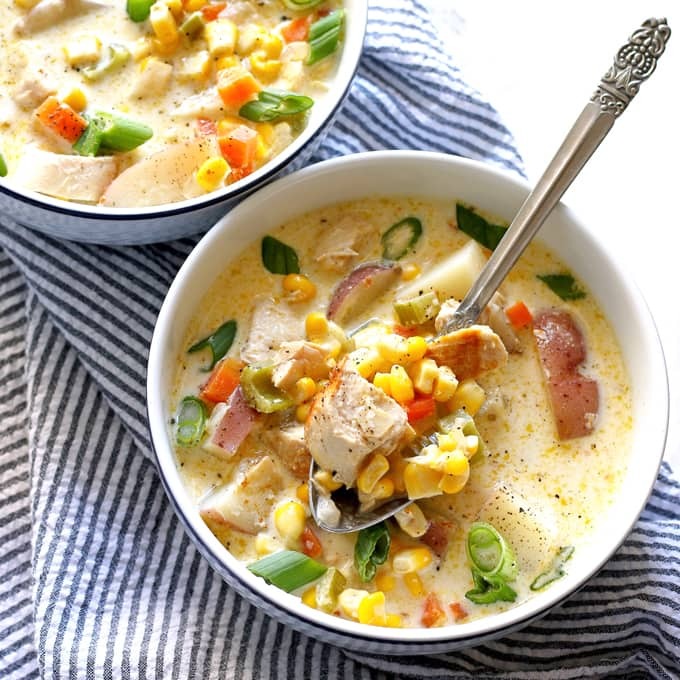 Try my chicken corn chowder recipe! 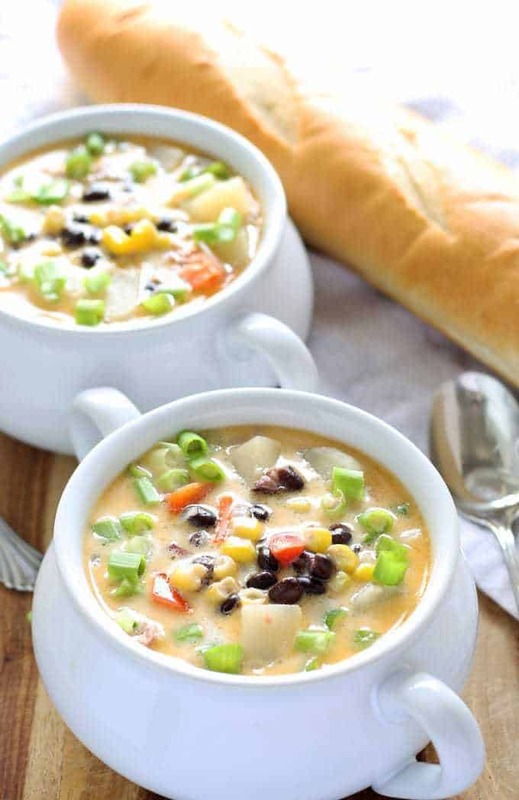 Or my black bean corn chowder! 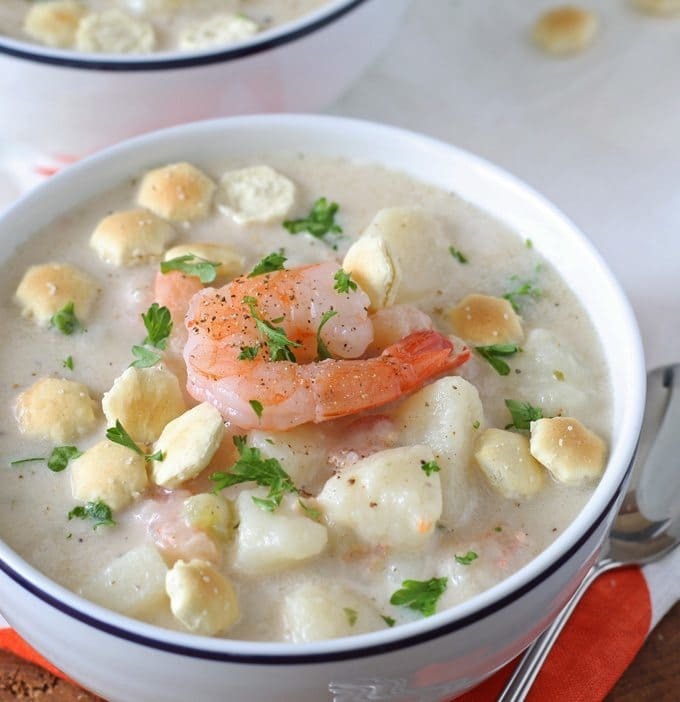 Also, if you are a seafood lover, this shrimp and potato chowder will really hit the spot! I never thought of putting chicken in potato soup! What a great idea! Thanks for sharing on the What’s for Dinner link up and don’t forget to leave a comment at the party – Next week’s features that also leave a comment get pinned and tweeted! yum! had to pin this one! My husband loves soup year round too; me, not so much, but this sounds like the perfect fall comfort food. So I am pinning it to try once the weather cools down! A bowl of this is going to be needed each week this fall. That looks scrumptious and with the addition of all that bacon it’s guaranteed to be a winner! Everywhere I go this recipe stares at me!! I wish I had a huge bowl right now! I am SO ready for all. the. soups. This looks so comforting! Ahhh! The ultimate comfort food for Fall! Mmmmm! Oh wow!! 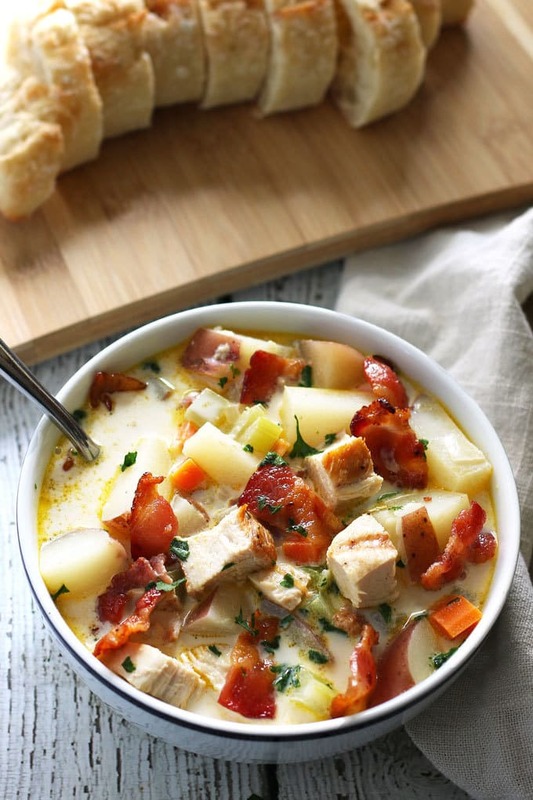 This Chicken and Potato Chowder is amaaaazing!! Looks delicious! But is that calorie count for real? Yikes! Yummy, I love chowders! I’m always craving soup too, even when we are having triple digit heat during the summer. Thanks for joining the Family Joy Link Party! Chowder season is right around the corner! This looks SO good! (as do all of your soups!). Pinned and I can’t wait to try it. This sounds so good. Can’t wait for the days to get a little cooler and then we’ll try it out! Thanks for sharing your recipe! We love one pot meals, seem to last for more than one meal and are usually economical to make. This being said we are getting thru 3rd. month of 5 weeks between paydays on SS. We’ve learned hard way how to live thru those months during that roaring fun recession. This chowder looks so tasty had to print it out for something different to eat/make. We have lots of one-pot meals under our belts but when I find new to us recipe, make sure to print it out. Sure glad you shared all these. Have wonderful weekend. We eat soup year round too! This needs to be one of them! Looks yummy! Going on my fall must try list. Thanks for sharing at the Inspiration Spotlight party. Pinned & shared. See you again soon. Thanks for sharing your delicious recipe at Inspire Me Monday at Create With Joy – you are one of our featured guests this week! Those chowders looks devine. When on holidays in San Francisco a fews ago we had the clam chowder and ever since have always enjoyed chowders. I just made this. It’s super easy and makes a great meal with a crusty dinner roll. I tweaked it a bit because I wanted it thicker. I added some corn starch slurry for that. I had some corn left over from a previous meal, so I added that to. This is delicious! Thanks for sharing!